Arnhem has a rich and evolving history that can be seen throughout the city. As a result of WWII bombing, new and old buildings are entwined. Around every corner is another hidden treasure. Looking for houses can be confusing if you don’t know anything about the area. Here we try to give recommendations on areas from our own experiences. This is not an exhaustive list – we haven’t lived everywhere. If you have something to add to it then let us know. 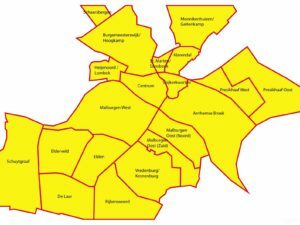 The Schuytgraaf district is a popular place for expats, mostly because it is home to the famous Rivers International school. A shopping mall just opened there too, lots of safe cycle paths and as well the Arnhem South train station – so commuting to and from is very handy. There are mostly newly built homes with lots of playgrounds. This is the “expat” area district. De Laar Oost in Arnhem south is a lovely area for a family. It is very safe and kid friendly. With numerous playgrounds everywhere, bike pads, parks, Rijkerswoerds plassen (the local beach) just a few minutes with the bike. As well as the small shopping centre with major shops such as: Praxis, Kwantum, Action, Big Bazaar, Prenatal, Leen Bakker, Carpet Right, Intertoys, etc. There is also a Jumbo supermarket just a few minutes away, Kronenburg mall just a 5 minute drive and the city center a short 7 minute drive. There are 2 kindergartens in the area with two schools, after school care and a SPA peuterspeelzal with a small free petting zoo, as well as the indoor play centre Ballorig (https://www.ballorig.nl/arnhem). The neighbourhood is close to the popular for expats Schuytgraaf, home to the international Rivers school (10 minute bike ride).